Ever been swimming at night in your local pool? Then you know that underwater lighting helps make it fun. But you know water is a good conductor of electricity, right? So, why don’t we get shocked or electrocuted when electrical lighting is submerged under water? Experts explain that there are two main ways to light a pool safely. The method used most is called “wet niche lighting.” Very bright hot-burning bulbs throw huge beams of light to make a pool look inviting on a hot night. Water never actually touches the electrical parts of the lighting system. The bulb, wiring, and the cable that encloses the wiring are all permanently sealed against water with a material that does not conduct electricity. Wet niche lighting bulbs burn so bright and hot that they can only be used under water. They need the water to cool them constantly when they are turned on. If they are turned on outside of water, these bulbs burn out immediately. 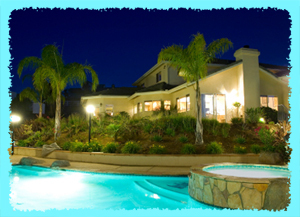 Fiber optic lighting is the second method to light swimming pools safely. It is expensive and not often used in local or backyard swimming pools. In fiber optics, light is transmitted down a thread or cable of transparent material that reflects light well, such as plastic or glass. The fiber glows with light, and the light follows the fiber however it bends or curves. It is as if beams of light traveled through a tunnel by bouncing off millions of tiny mirrors! One reason that fiber optic lights are so good for swimming pools is that the electricity that supplies the light can be far away from the water, so there is no chance of water accidentally touching live wires and causing a shock. Fiber optic lighting can be used creatively to make effects that are beautiful and fun. Designers have fun using these flexible fiber optic tubes and cables of light to outline and decorate pools and other outdoor areas. You can see fiber optic lighting used creatively in Disney World and the Tokyo Dome in Japan. Maybe one day you’ll use it to spell out your name in lights at the bottom of your own backyard pool! Cool!